The arrival of the Amazon Kindle Fire tablet has made the world of 7-inch tablets are much more interesting place and with a wallet-friendly price it also has the iPad 2 in its sights. The tale of tablets and fashion mixing in the same circles has been a brief and forgetful period in tablet history (remember the Next tablet?). 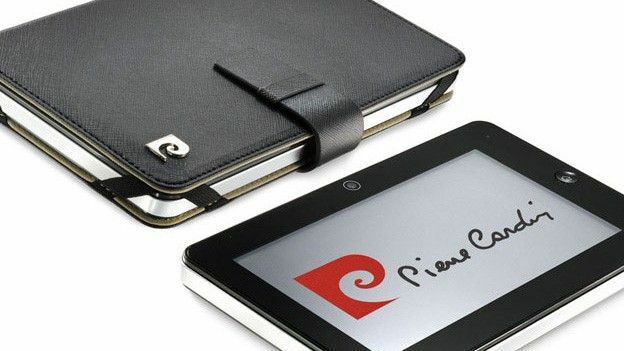 Could the Pierre Cardin PC-7006 tablet prove that you can offer style and substance? At 520g the Pierre Cardin tablet is one of the heaviest 7-inch tablets on the market, but it is the weight distribution that we have real problems with. One side of the tablet is significantly heavier than the other which makes for a truly uncomfortable feel when holding in one hand. It's easy to see where the design inspiration stems from with its glass screen housed within a black border frame and chrome effect edging. There is a home button just like the iPhone 4 and three physical buttons on the top of the device, annoyingly there is no button for volume control which means you have to tap the volume icon on the top taskbar to adjust instead. The Pierre Cardin tablet does have more ports than the iPad 2 with two mini USB ports, a HDMI connection to hook up to a TV and a Micro SD card with support up to 16GB, however you can only charge via the mains adaptor so make sure you take good care of that. The 7-inch capacitive multi-touch screen has 800x480 pixel resolution which when compared to the HTC Flyer and BlackBerry PlayBook, pales in comparison. It becomes evident almost immediately that it lacks greatly in the vibrancy department, and while we'd maybe expect this from a budget smartphone, we wouldn't from a tablet that is almost £300. It may not feel antiquated in smartphone terms, but with Android 2.3 Gingerbread or Android 3.1 Honeycomb tablets already available in the same price range we are not sure why people would opt for an older OS. With the standard five homescreens layout, the PC-7006 also appears to be running a custom skin over the top which doesn't improve and already disappointing user experience. Running on the same Samsung 1.0 Ghz A8 processor found in the iPad there's significant zip under the fingers for browsing and navigating, which is certainly one of few positives. There's support for both Wi-Fi (802.11b/g) and 3G, but if you want to connect via the latter you will need get your hands on the appropriate 3G Dongle that unfortunately doesn't come in the box. We've yet to see the true benefits of rear-facing cameras on a tablets, but when most have them, we were surprised to see just a 1.3 Megapixel front-facing camera. Results for pictures were less than impressive delivering grainy, drab images. You can also shoot 720p HD video but not let's too carried away, this was similarly grainy in performance. Other notable features include an E-Book reader, access to the Android Market, Gmail, Google Maps and the standard Android hangouts. We tried out the multimedia player which you can transfer music from your computer, but we wouldn't bother. The sound performance is mediocre at best, and when we plugged in the cheap-looking headphones included sound performance was extremely tinny. Boasting a Lithium 4400mAh battery you can expect to get around 8 or so hours of use before you have to charge up again, but as we mentioned earlier in the review lack of USB charging means keeping hold of the mains adaptor is a must. In comparison to other 7-inch tablets and other tablets in this price bracket the HTC flyer is touted to have 8-14 hours in standby mode while the PlayBook is around 10 hours, so it doesn't really shine on that front either. When one of the few positives is the leather-like case included, it doesn't bode well for the PC-7006. It runs on a version of Android which feels aged compared to Honeycomb and Gingerbread and has a heavy build that hampers the overall tablet experience. It may look like a big iPhone 4, but don't be fooled, this is not in the same league as the Apple smartphone let alone any other tablet of its kind. If we had some advice for Pierre Cardin, it would be to stick to what you know, mid-priced suits and leave the tablet business to the big boys.